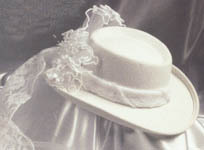 Cultured Cowboy carries a nice selection of Western Bridal Hats, many especially designed to match one of our Wedding Gowns. 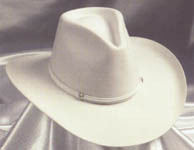 Choose from any of the following or if you want a customized hat, ship your trim to Cultured Cowboy and we will be happy to apply it your choice of style. 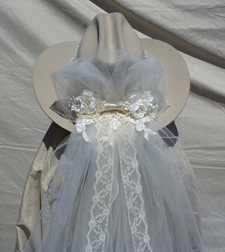 Dresses for your bridal party are shown under our sites for Flower Girls' Dresses and Bridesmaids' Dresses. 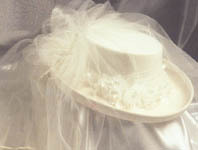 Please note that several of the Western Bridal Hats shown can be customized to better match the coordinating wedding gown. 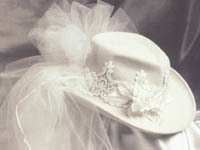 The manufacturer uses hat styles that are readily available and applies lace and beading to accentuate each hat's detail. 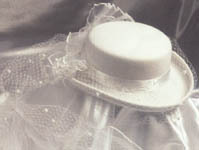 Though the hats pictured are representative, please be aware that there may be some slight variation in the actual style you receive, just because of the supply available of the trims. 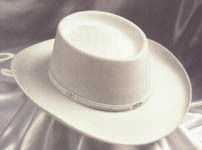 Also remember that brims can be adjusted to suit your particular taste. 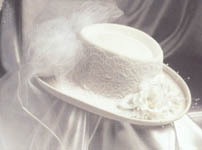 These hats may need to be made to order for you, so please allow ample time. - Thanks and God Bless!